For our summer internship, we worked with Historic Royal Palaces (HRP) based at Banqueting House in London. Banqueting House Whitehall is the last surviving structure of the Palace of Whitehall that was designed by Inigo Jones in the 17th century. It is considered the first major classical building completed in England and it houses the original ceiling paintings by Peter Paul Rubens depicting The Union of the Crowns, The Apotheosis of James I, and The Peaceful Reign of James I. These paintings are the only surviving in-situ ceiling paintings completed by Peter Paul Rubens. As the only surviving structure from the Lost Palace of Whitehall, it is also the location of a number of significant events such as elaborate masques, King Charles I’s execution, and William of Orange and Mary Stuart acceptance of the crown. 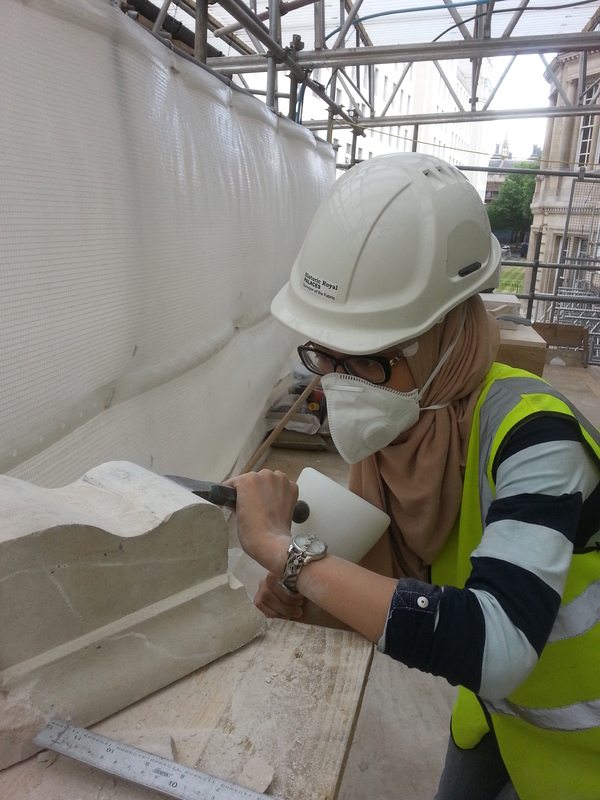 Currently, HRP is undertaking the first phase of conservation work at the Banqueting House which began in January of 2015. 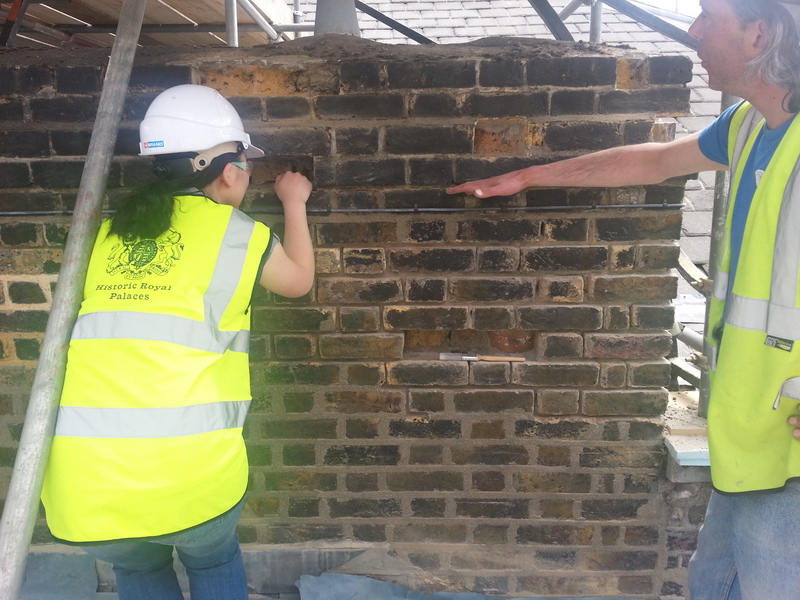 Phase I consists of mostly external repairs such as roof and water downpipe lead work, stone and brick masonry cracks, lime render, window glazing and painting, and night lighting of the front elevation. 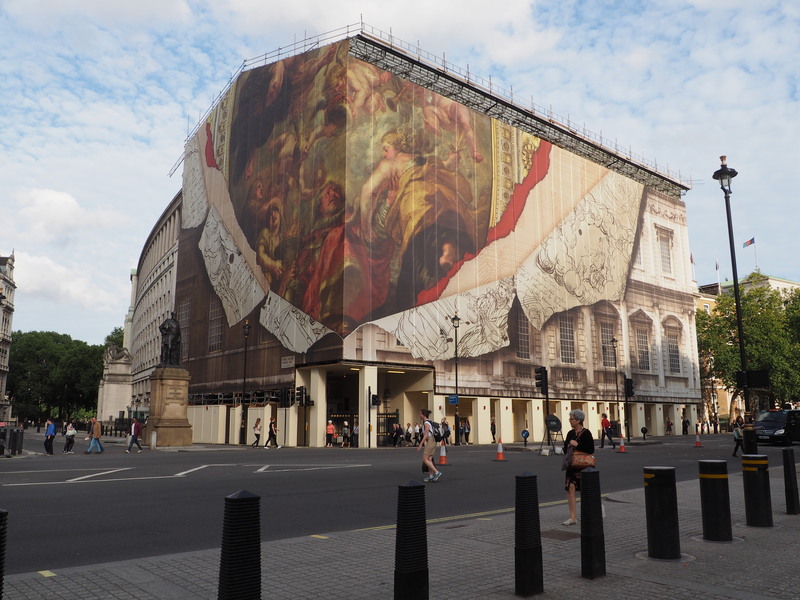 Working with Jo Thwaites – Surveyor of the Fabric, we have been given the opportunity to work closely with various conservators and craftsmen on the scaffold of Banqueting House. 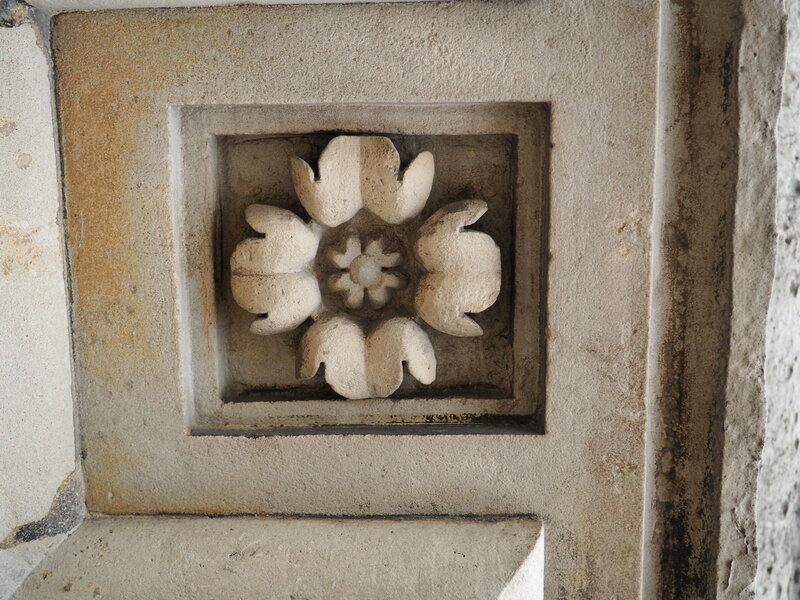 We worked on a number of small projects but our main project was the documentation and conditions assessment of the individual stone rosettes located on the upper and lower levels of the east and west facades. This detail has never previously documented. Due to extensive water damage at certain areas of the façade where the lead flashing has failed, some of the stone rosettes are severely deteriorated or missing. Each rosette and its exact location and condition has been documented for further analysis and study. To better understanding stone and brick masonry, mini workshops on stone repair, stone carving, and bricklaying were provided by the masons. These mini workshops were documented and reported on a weekly basis. They provided a general understanding of the work on the façade, and the reports outlined the details for future reference. We also contributed entries to the project diary that documents and reports the progress of the work on the scaffold. These entries outline the methodology and procedures of work of the work being carried out. As part of interpretations, we were also involved in the testing process of different prototype designs that presented the story of the “Lost Palace of Whitehall.” This is a narrative that will be presented to the public regarding the Palace of Whitehall that has been lost due to fire. This creative process included different mediums of storytelling and the integration of modern technology. With Learning and Engagement, we helped document and assist the scaffold tours that were conducted at Banqueting House. These were tours opened to staff, and eventually the general public to observe the conservation work being done on the building fabric. These tours helped visitors to really appreciate the craftsmanship of the stone carvings and details of the façade up close. Generously, we were given the opportunity to conduct personal experiments and interviews regarding our individual research interest. The resources available on site not only included physical materials, but also information from the skilled craftsmen. Over the course of the internship, we were also given numerous tours of the other properties managed by HRP, and how each conservation project is managed. Most of the time, these tours were led by the conservators and they were able to give in-depth information about the goals and progress of the project. 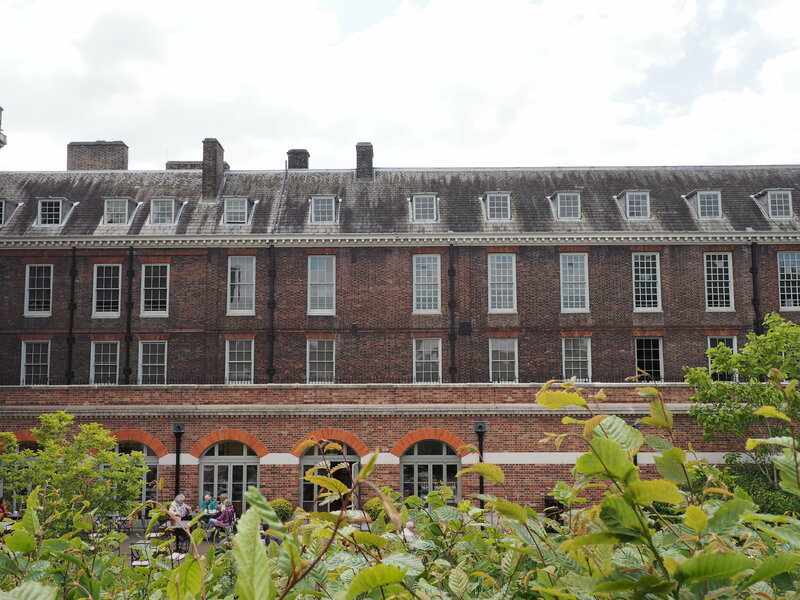 The following is a list of the properties managed by HRP that we toured: Kensington Palace, Tower of London, Hampton Court, and Kew Palace. 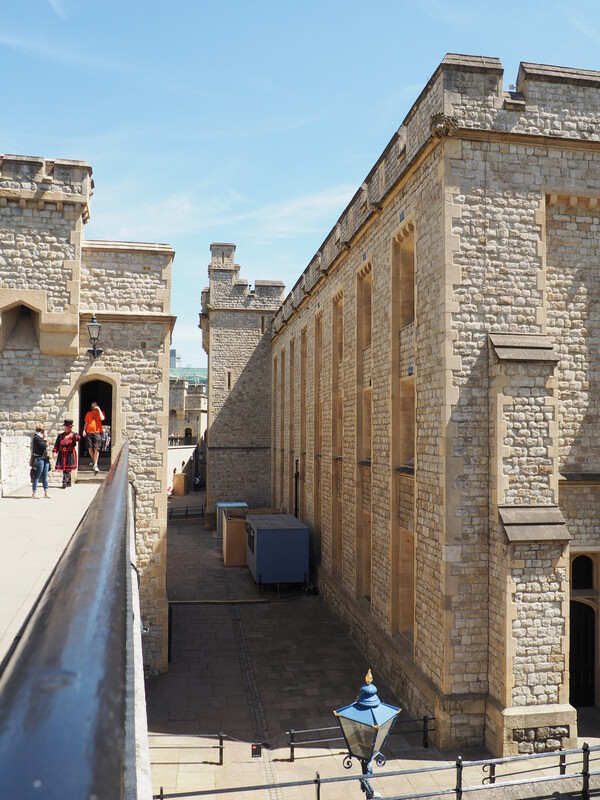 Particularly with the Tower of London, we produced an in-depth report of the visitor experience and the various means of way-finding. Our internship spanned over a period of two months and the exposure to being on a working construction site with the conservators and how they approach the project has been invaluable. Interacting with craftsmen and the mini workshops and tours have enriched the entire experience.